SALT LAKE CITY (June 6, 2018) – True to its nickname as “America’s Toughest Stage Race,” the 2018 Larry H. Miller Tour of Utah will dish out 536 miles of racing and 43,780 feet of elevation gain this summer. Detailed maps and informational videos are now available online for the seven-day, men’s professional cycling stage race on Aug. 6-12. The Tour of Utah course will offer a total of nine Utah Office of Tourism King of the Mountain (KOM) climbs. It is the fifth time in 14 years that the Tour has included more than 43,000 feet of climbing. The highest climb of the race comes on Stage 1 near the ski resort town of Brian Head at 10,600 feet above sea level. Returning to the Tour are the summits of three legendary climbs — Mount Nebo, Little Cottonwood Canyon and Empire Pass, the latter two classified as Hors Category (HC, or beyond classification). Mount Nebo is the highest mountain in the Wasatch Range. The six-mile ascent of Little Cottonwood Canyon will take riders to the “Queen Stage” finish at Snowbird Resort on Stage 5 and the seven-mile incline across Empire Pass with pitches of more than 20 percent will set up the showdown in Park City for Stage 6 on the final day of racing. The Utah Sports Commission, which is a founding partner of the Tour, returns as the presenting sponsor for 13 sprint lines along the course. 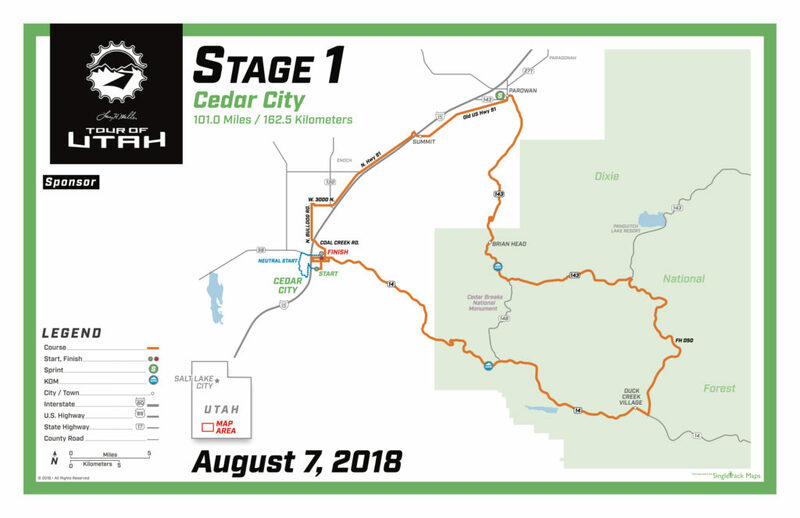 Stages 1-6 will showcase at least one intermediate sprint location each day, with Farmington having two sprints on Stage 3 and Salt Lake City having three sprints on Stage 4. Start times for Stages 1-6 vary to accommodate live national television on FOX Sports Network (FSN), which will broadcast the final two hours of action each day in the 2-4 p.m. MT time slot. Monday’s Prologue in St. George will take place from 10 a.m.-12:30 p.m., before the heat of the day settles in the southernmost point of the Tour, and will be a tape-delay FSN broadcast. All seven days of racing will be shown live, start to finish, by TourTracker presented by Adobe free of charge on mobile devices and the Tour’s website. More details regarding TourTracker coverage and FSN regional programming will be made available in July. For just the second time since the Tour joined the UCI America Tour in 2011, a Prologue will be held on the opening day of racing on Monday, Aug. 6. The race against the clock will be a fast 3.3 miles (5.3 km) in St. George, the Tour’s inaugural visit to this sports mecca in the southwest corner of Utah. The out-and-back course will take place on Red Hills Parkway, adjacent to Pioneer Park. Just like the name of the road implies, athletes and spectators alike will be treated to inspiring views of the Red Cliffs Desert Reserve. It provides a mellow climb for the first two kilometers, followed by a short downhill to the turnaround. This provides a short climb to begin the return and a rapid, straight downhill track to the finish. The time gaps will be small for the 120-plus riders representing 17 professional teams, but it will set the stage for a great week of racing. Stage 1 presented by America First Credit Union returns to Cedar City for a fourth time. Cedar City will also serve as race headquarters for overall start festivities, including the Team Presentation on Saturday, Aug. 4, which is free for spectators. Racing takes place on Tuesday, Aug. 7 for the 101-mile (162.5 km) Stage 1 route, which includes 8,950 feet of elevation gain. It also features the highest climb of the week through Cedar Breaks National Monument, topping out at 10,600 feet. The course is similar to the one used in 2016, this year with a new circuit finish in downtown Cedar City. The first Utah Sports Commission Sprint line will be contested in Parowan, then hit a Category 1 climb up Parowan Canyon through Brian Head. This ascent into Cedar Breaks National Monument climbs 4,500 vertical feet in 15 miles, with some sections challenging riders with a 15 percent gradient. The riders will traverse the Markagunt Plateau and serpentine through the Mammoth Creek lava flows. After turning west in Duck Creek, the riders will face a KOM at Bristlecone, named after the 2,500-year-old Bristlecone pine trees that line the summit. Then it’s all downhill into the college town of Cedar City. The riders will complete three circuits around Cedar City and the campus of Southern Utah University. A new finish line will be placed in front of the new Southern Utah Museum of Art, a student-centered experiential learning environment that collects, preserves and exhibits the visual arts of southern Utah and surrounding Colorado Plateau. Like the race, the Museum of Art is free for the public to enjoy. 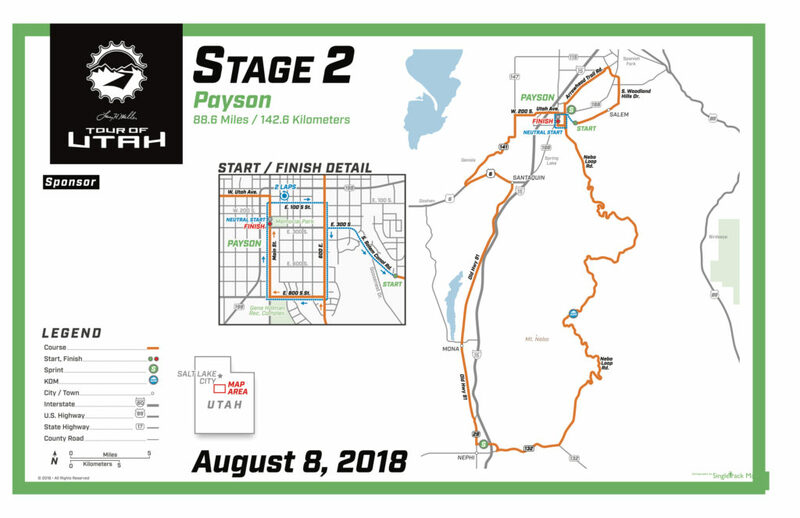 Stage 2 on Wednesday, Aug. 8, returns to Payson City for a third time. The focus of the day will be the towering peak of Mount Nebo, making a seventh appearance in the Tour and last featured in 2016. This year, the 88.6-mile (142.6 km) route will start and finish in Payson City for the first time. After a 12-mile circuit north of town into Utah County, the race will return to Payson for a sprint in front of historic Peteetneet Museum and pass through the start/finish area at Memorial Park. The route will then travel south through the orchards and lavender fields along Old U.S. Highway 91 for a sprint line in Nephi, then the final push on the Category 1 ascent across Mount Nebo. Sitting at 11,928 feet, Mount Nebo is the southernmost and highest mountain in the Wasatch Range of Utah. The cyclists will summit the roadway at 9,300 feet for the one KOM on the day, then have a twisting 22-mile descent for the finish back into the classic western town of Payson. Stage 3 presented by America First Credit Union on Thursday, Aug. 9 is the longest stage of the week at 104 miles (167.4 km). A new start on the far end of Antelope Island takes place at the Garr Ranch. It is the third time the Tour has started on the island that boasts more than 600 American Bison and large herds of mule deer. After a wind-swept seven miles over the causeway to cross the Great Salt Lake's Farmington Bay to the mainland, the race will serpentine through Davis County to the new finish in Layton City. It is the fourth consecutive year for Davis County to host the Tour, featuring an abundance of turns and a variety road widths that make for a tough and stressful day for the racers. Sprint lines will be contested once in Syracuse and twice in Farmington. One short, steep KOM up the Bountiful Bench could be the launching pad for a late breakaway. On the return stretch from Bountiful to the finish in Layton, the race will pass through Hill Air Force Base for a second year. After three circuits through Layton Commons Park, a stage winner will be crowned on North Wasatch Drive across from the park. 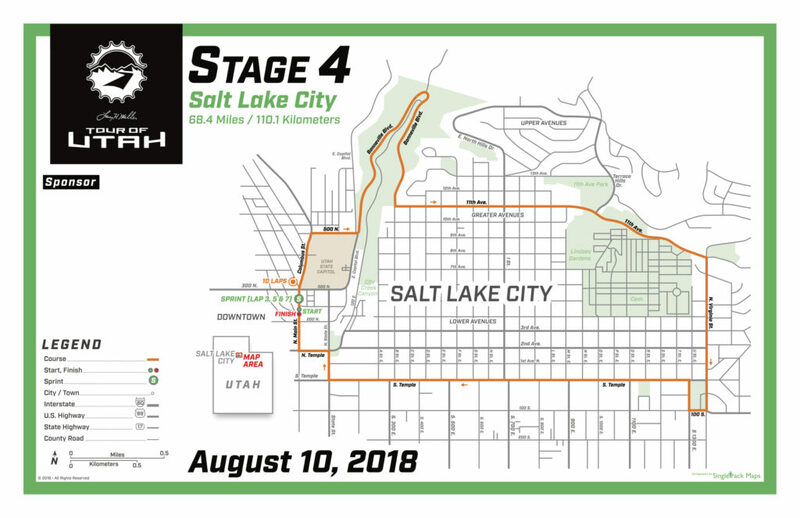 Stage 4 presented by Zions Bank returns to downtown Salt Lake City with a modified course. The start/finish line has moved from Capitol Hill to North Main Street, with an amazing backdrop of the Salt Lake City skyline. The riders will tackle 10 laps of the 6.8-mile downtown course for a total of 68.4 miles (110.1 km) and 5,500 of elevation gain. Utah Sports Commission Sprints will be contested at the start/finish line on laps 3, 5 and 7. The course will flow north from Main Street through the Marmalade District to the steep ascent of 500 North, a section used for a finish line in 2015. The race will then follow the traditional route through City Creek Canyon and the Avenues neighborhood on 11th Avenue to a descent along Virginia Avenue by the University of Utah. Rounding Reservoir Park, the route returns downtown on South Temple and turns under the Eagle Gate on State Street to twist from North Temple to the uphill finish on North Main Street. It is the 11th year that Salt Lake City has served as a stage host, and a seventh time for a circuit course downtown. Stage 5 presented by University of Utah Health hails the return of the notorious “Queen Stage,” with 9,975 feet of elevation gain. 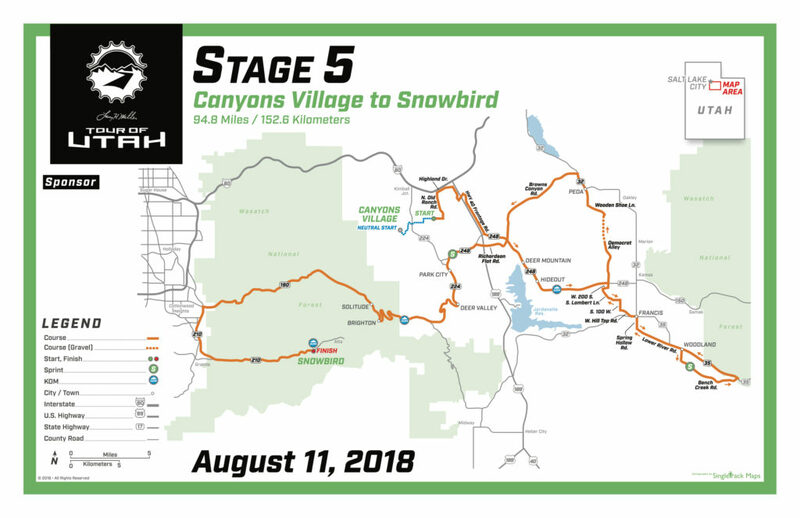 On Saturday, Aug. 11, Stage 5 will feature 94.8 miles (152.6 km) of racing from a new start at Canyons Village in Park City to the signature finish at Snowbird Resort. In the winter, Snowbird Resort is known for 500 inches of annual snowfall and powder skiing. In the summer, Snowbird Resort is known for the fan frenzy of Tanners Flat along the climb and the shake out of contenders for the Larry H. Miller Group of Companies overall leader jersey at the finish. The race has finished at Snowbird Resort 11 times, and only twice has the winner of the stage worn the winner’s jersey at the end of the week. The day begins at 7:30 a.m. MT in Canyons Village with The Ultimate Challenge presented by University of Utah Health, a unique cycling event for amateurs to traverse the same demanding mountain course as the pros. This marks the eighth year for this non-competitive, gran fondo-style bicycle ride. The professional teams take off from Canyons Village at 11:30 a.m. The undulating terrain of Summit County includes an early KOM past Deer Mountain at Jordanelle Reservoir, a sprint at Wolf Creek Ranch, and a two-mile stretch of dirt road on Democrat Alley. The route then goes through Peoa and up Browns Canyon to reach historic Park City for a second sprint line of the day and the ascent of the Category 1 KOM, Guardsman Pass. A blistering 15-mile descent of Big Cottonwood Canyon leads to the Salt Lake Valley below and a short traverse along Wasatch Boulevard. Then it is on to the HC climb up Little Cottonwood Canyon for the signature six-mile battle across gradients of eight to 12 percent to the finish line at Snowbird Resort. 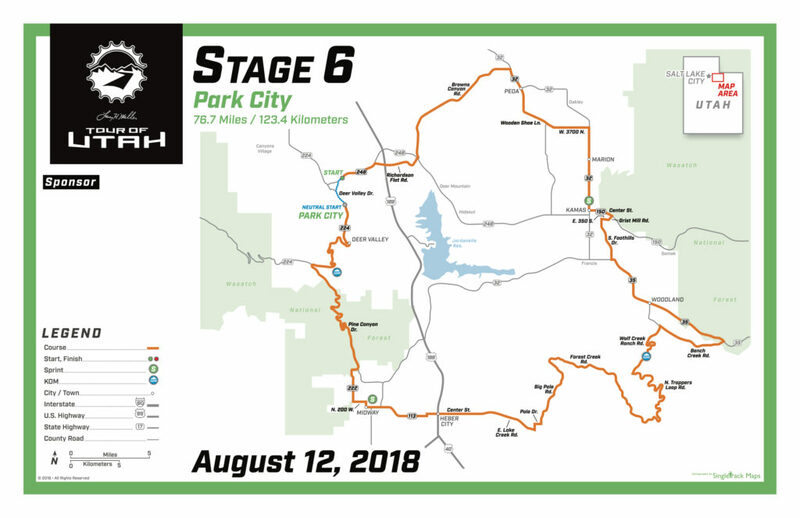 After a one-year hiatus, Stage 6 presented by Utah Sports Commission brings back the overall finish to Park City on Sunday, Aug. 12. Historic Park City entertains the Tour for a ninth time, and a sixth time for the overall race finish. The route will pass down Browns Canyon and encounter a Sprint line in the town of Kamas before tackling a short Category 3 KOM in the private community of Wolf Creek Ranch. A technical descent into Wasatch County will allow the riders to regroup through Heber City before the final sprint line in Midway. From there, riders will jockey for position at the bottom of Pine Canyon Road for the HC climb of Empire Pass. While the road conditions have improved with new pavement since it was last used in 2016, riders continue to battle road pitches of 10 to 20 percent. The race doesn’t end at the top of Empire Pass. Spectators are encouraged to arrive early and get a viewing spot on Upper Main Street in Park City for the exciting finish. The Larry H. Miller Tour of Utah is free to all spectators, making professional cycling one of the most unique professional sports in the world today. 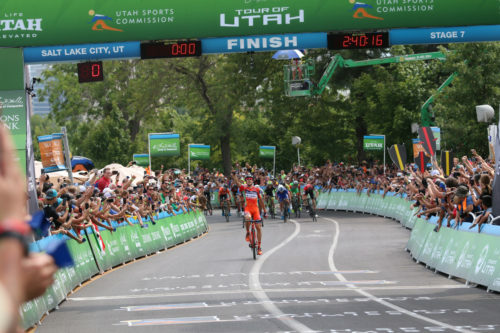 The Tour of Utah remains a 2.HC-rated stage race on the UCI America Tour, making it one of the premier events for professional cycling teams in North America. It is also one of the prominent road cycling events that is also part of USA Cycling’s Pro Road Tour. Registration for The Ultimate Challenge presented by University of Utah Health is available online for $140, with a team discount offered for groups of eight or more. More information about the Larry H. Miller Tour of Utah and The Ultimate Challenge can be found by visiting www.tourofutah.com, as well as social channels Facebook (tourofutah), Twitter (tourofutah), Instagram (thetourofutah) and YouTube (Tour of Utah). Route Map of the prologue of the 2018 Tour of Utah. Route Map of Stage 1 of the 2018 Tour of Utah. Route Map of Stage 2 of the 2018 Tour of Utah. 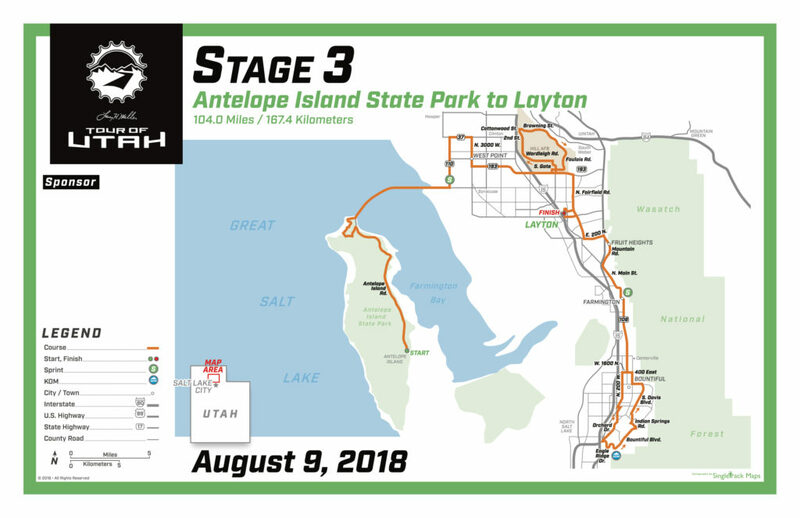 Route Map of Stage 3 of the 2018 Tour of Utah. Route Map of Stage 4 of the 2018 Tour of Utah. Route Map of Stage 5 of the 2018 Tour of Utah. Route Map of Stage 6 of the 2018 Tour of Utah.